Paul Giamatti’s gradual ascension to the upper echelon of indie stardom is due in no small part to his ability to convincingly portray those at the lowest ebb: from the hubristic filmmaker in ‘Storytelling’ (2001) to the failed writer in ‘Sideways’ (2004), Giamatti has turned in a litany of performances that run the gamut of failure, alienation and regret. Aided in no small part by a physiognomy that was made for tragedy, Giamatti’s normality has ironically become an asset in a business which places a premium on youth, beauty and exoticism. Prior to embarking on this adaptation of Mordecai Richler’s novel director Richard J. Lewis and writer Michael Konyves had a less than stellar track record. Lewis has worked on TV since the late ‘80s, directing shows as diverse as ‘Superboy’ and ‘CSI’, while Konyves has a handful of TV movies to his credit. So the fact that they came together to produce a work of such distinction makes ‘Barney’s Version’ an even more tremendous achievement. As its title implies, ‘Barney’s Version’ is an account of the life of Barney Panofsky (Giamatti), told entirely from his perspective. Barney is a sixty-five-year-old producer of ‘totally unnecessary’ TV who becomes the subject of a book by a police detective (Mark Addy), which accuses him of murdering his best friend, Boogie (Scott Speedman). The film flits between time frames, recounting Barney’s three marriages and shedding light on the circumstances surrounding Boogie’s death. Much like ‘Confessions of a Dangerous Mind’ (2002), ‘Barney’s Version’ is a prime example of the unreliable storyteller at work, outlining the inherently subjective nature of biography. One can never be entirely sure if what we are witnessing is the mendacious testimony of a guilty man or an honest appraisal of events; whether these are the people as they really were or how Barney would prefer they are remembered. The memories occur at random, Proustian rushes stirred by external stimuli, using Barney recollecting them as a handy bridging device. 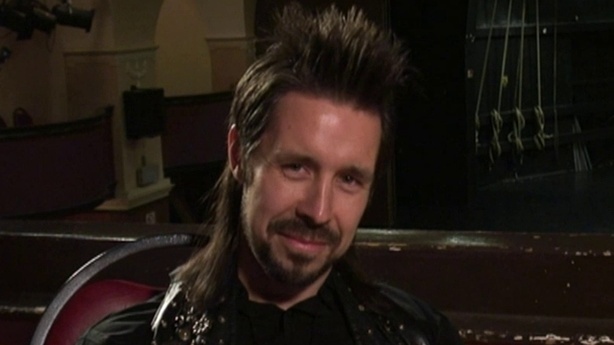 Lewis draws on a number of influences: the freeze frames, musical interludes, photo montages and slow motion bring Scorsese to mind, the kinetic camerawork is reminiscent of Lumet at his dynamic best, and the conversational scenes using New York as a backdrop are straight out of classic Allen. But this is not the kind of directorial karaoke from which certain ‘auteurs’ of renown have made their fortunes. Lewis doesn’t use these stylistic flourishes as crutches, but implements them at appropriate moments. Guy Dufaux’s cinematography creates a distinct ambiance for each temporal shift, Claude Pare’s production design authentically replicates each period depicted, and Konyves’ screenplay is brimming with ribald humour and caustic bòn móts – ‘She subscribes to the Economist but buys Vogue off the stand’ being one of the most memorable. Giamatti delivers a barnstorming turn as the querulous, vindictive soul who seems out of place in the modern world. He does an outstanding job of lending pathos to this most ambiguous of protagonists; a philanderer and possibly a murderer, mining the insecurities of the autodidact, his hunched, lumbering gait and pinched diction articulating Barney’s woes. Dustin Hoffman is in rare form as Barney’s father, a charming, roguish ex-cop with a darkness and hurt lurking beneath the gregarious surface: it is Hoffman’s best performance since he stole the show in ‘Wag the Dog’ (1997). Giamatti and Hoffman are a joy to watch together; neither trying to upstage the other, both secure and generous enough to accurately chart the father/son dynamic. Barney’s wives are played to perfection by Rochelle Lefevre, Minnie Driver and Rosamund Pike; as his foul-mouthed, free-spirited first wife, garrulous, ambitious second wife and radiant, indulgent third wife respectively. It would be a mistake to dismiss ‘Barney’s Version’ as a ‘Jewish film’, just as it would be to write off Spike Lee as a maker of ‘black films’: it may take place within a specific milieu, but it deals with a range of concerns that transcend cultural boundaries. ‘Barney’s Version’ is as much about platonic male love as Barney’s romantic travails: his relationship with Boogie is the most lasting and meaningful of his life, and he constantly searches for a woman who understands him on the same level. The film illustrates the futility of revenge, the most heinous form of mutually assured emotional destruction. The twelve years it took to bring ‘Barney’s Version’ to the screen were not wasted: this is a work whose quality will endure, and whose influence will only appreciate over time. 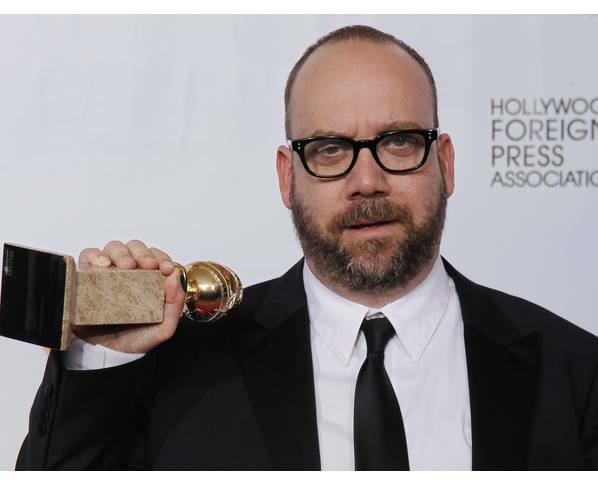 Giamatti, with the Golden Globe he won for his portrayal of Barney. This adaptation of J.P. Miller’s teleplay is an intriguing anomaly in the career of Blake Edwards, a director renowned for helming lightweight fare like ‘Breakfast at Tiffany’s’, ‘The Pink Panther’ and ‘10’. Likewise, this marked something of a departure for its star, Jack Lemmon, who had carved out a niche playing lovable, befuddled everyman in the likes of ‘The Apartment’ and ‘Some Like It Hot’. ‘Days of Wine and Roses’ is an interesting film historically, marking something of a bridge between the production-line output of the old studio system and the daring, taboo-breaking new spirit that would emerge towards the end of the decade and reach its apotheosis with ‘Easy Rider’. The film charts the courtship and marriage of Joe Clay (Lemmon) and Kirsten Arnesen (Lee Remick). Joe is a high-flying Public Relations man, which in reality involves little more than kowtowing to the egos of his upscale clients, whether it be procuring women or finagling flattering press coverage. Kirsten is the assistant to one of Joe’s top clients; a bookish young woman who prefers chocolate to Joe’s chosen vice. Joe eventually introduces Kirsten to the anaesthetizing joys of alcohol. Now with a child to care for, Kirsten and Joe descend into the hell of full-scale alcoholism, their hard-living lifestyles coming into conflict with their cosy domesticity. ‘Days of Wine and Roses’ is shot in downcast monochrome, Phil Lathrop’s photography noticeably darkens with the characters’ worsening circumstances, the expressionistic lighting patterns and slabs of shadow increasing as addiction’s grip tightens. Henry Mancini’s Oscar-winning score does much to articulate this slide into the depths of despair, with its doleful, jazzy tones. Edwards sticks to delicate pans and noncommittal medium shots for the most part, a decision that lends genuine significance to the few close-ups he uses – as when Kirsten’s father offers Joe a drink; his dilemma is etched all over Lemmon’s famously expressive face. Lemmon is captivating as a world-weary cog in the machine; his impeccable comic and dramatic timing are equally in evidence here. He imbues an essentially unlovable character with much needed empathy and humanity, underscoring Joe’s misgivings about the ethical vacuum in which he operates. Kirsten’s decline is particularly heartrending, and Remick rises to the task of conveying this. She undergoes a startling physical transformation, beginning the film as a statuesque, insouciant beauty and ending it a haggard, crestfallen husk of a person. It comes as little surprise that both leads were nominated for Oscars. Though Lemmon and Remick provide the film’s core, ample support is provided by Charles Bickford as Kirsten’s redoubtable father, a man struggling to keep his daughter from following Joe down the path to self-destruction. ‘Days of Wine and Roses’ takes place at a time when America’s moral consensus was beginning to erode; when people began to question the values they’d been taught to believe in, when job security and the promise of advancement up the career ladder was no longer enough to pacify nagging doubts and frustrations. The film underlines this dysphoria. Kirsten is plagued by alarming reveries, using drink to blot out the grime she sees all around her – the world is dirty when she is sober. Jack despises the dark art of perception management, a world where integrity is an impediment to success, consumed by guilt for dragging Kirsten down with him. They are trapped in a mutually destructive union, bound by their need to seek solace in the bottle. The film’s final third occasionally falls prey to preachy moralizing in the form of Jack Klugman’s Alcoholics Anonymous leader, but any lapse into melodrama is offset by the strength of the performances. 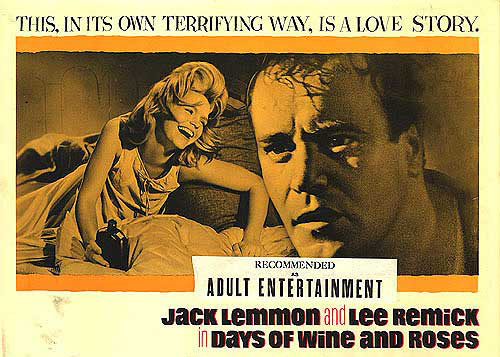 ‘Days of Wine and Roses’ is not a comic account of affable drunks or a mawkish cautionary tale – the most common approaches to the depiction of alcoholism – but an important progression in screen realism, comparing favourably to the yardstick, Billy Wilder’s ‘The Lost Weekend’. Jack Clay is up there with Harry Stoner in ‘Save the Tiger’ and Shelley Levine in ‘Glengarry Glen Ross’ as a seminal role in Lemmon’s legendary career. Why aren't movie posters this good anymore? The Leopold and Loeb case has been fertile ground for film-makers; from Hitchcock’s experimental ‘Rope’, to Tom Kalin’s turgid ‘Swoon’, to Michael Haneke’s hectoring guilt-by-association-fest ‘Funny Games’, to Rafal Zielinski’s criminally overlooked female take on the ‘thrill kill’ phenomenon ‘Fun’. But ‘Compulsion’ remains the most well-known, primarily because Nathan Leopold sued the film’s makers for defamation of character; which, ironically, only served to boost the profile of the film. ‘Compulsion’ is emblematic of Hollywood’s preoccupation with ‘message’ movies in the late ‘50s/early ‘60s, the undisputed king of which being Stanley Kramer. ‘Compulsion’ tells the tale of Judd Steiner (Dean Stockwell) and Arthur Strauss (Bradford Dillman); two wealthy college students who see themselves as Nietzschian supermen beyond good and evil. They undertake to explore all the possibilities of human existence, a quest which culminates in the murder of a teenage boy. Sid Brookes (Martin Milner), a fellow student working part-time as a journalist, finds a pair of glasses from the crime scene that links Steiner to the murder. Strauss and Steiner prepare an alibi, which quickly unravels under the scrutiny of District Attorney Harold Horn (E.G Marshall). They are charged and face the death penalty. Enter Jonathan Wilk (Orson Welles), a maverick defence attorney and vocal opponent of capital punishment who is employed by the students’ families to save them from the gallows. Journeyman director Richard Fleischer takes a conspicuously journalistic, Kramer-esque approach; the clinical, well-lit tone and unfussy shot selection provide a workmanlike platform for the performances, despite the lifeless soundstages and choreographed location shoots. Dillman plays the affable, brazen Strauss in a manner that seems hopelessly outdated and affected, when you consider that ‘On the Waterfront’ and its fine-de-siècle ilk had been in the ascendancy for much of the ‘50s. Strauss is intended to be the antagonist, the id to Steiner’s superego, but Dillman’s portrayal is so mannered that it renders the character little more than a snide caricature. Stockwell, on the other hand, pitches it perfect as the impressionable, bewildered Steiner, marking him out as an actor attuned to the changing timbre of his craft. Orson Welles’ had no such truck with this nascent naturalism and remained a steadfast adherent to the ’bombast’ approach to the last. His performance is that of an actor whose cinematic instincts have deserted him and is forced to fall back on showy theatrics, running roughshod over director and production – something Welles became infamous for when he deemed a project beneath his talents. 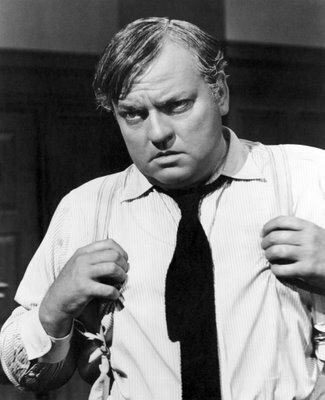 Grandstanding appeals to the jury abound in the heavily codified world of courtroom dramatics, and Welles savours this opportunity to use the culmination of the trial as a shop window for his acting chops; lurching around the set and delivering a disjointed, ranting, meandering, sonorous monologue for the best part of twenty minutes. But for all its melodrama, ‘Compulsion’ still has value when viewed in the context of the Cold War. Though set in the ‘20s, the film’s core themes resonate with the moral and philosophical sensibilities of ‘50s America – the conformist, proscriptive paranoid world of the slowly eroding moral majority. Much like Judd and Arthur’s homosexuality, the fear of communism is only ever alluded to; ‘rationalism’ and ‘secularism’ are invoked throughout as a handy euphemism for the godless faith. Judd and Arthur symbolize a world where certainty and order no longer hold sway, where nature’s innate cruelty has shaken people’s belief in a guiding force. America’s de facto class system is also addressed, albeit tentatively; the deference with which Judd and Arthur are treated when being questioned would not have been extended to suspects from less affluent backgrounds. Indeed, their interrogators refuse to believe at first that these privileged young men could be capable of such a heinous crime. ‘Compulsion’ goes as far as was permitted by the self-censorship of the industry and the squeamishness of society; but it still feels like a missed opportunity to deal with the case in an even-handed manner. Little attempt is made to explain what in fact compelled these two young men from well-to-do homes to act as they did, beyond blaming the big ideas their heads were filled with at their seat of learning. The apparent coldness of their home life is never addressed, as family life was sacrosanct in ‘50s America, an integral part of its self-perception as God’s Own Country. The one kernel of a dangerous idea that the original case – and the film, however unintentionally – posits is that the criminal urge transcends wealth, education and breeding, a contention that strikes at the very heart of the idea that these things are tools for amelioration. Richard Murphy’s screenplay ultimately shies away from this in favour of ‘morality lessons’; pandering to the status quo and allowing the audience to go home reassured that their values have not been challenged. Stand back, Mr Welles is about to declaim.